Chris is one leading figure in the technology field who has established the Innovation Centre with Bill Gates and won the HMS Royal Award for Exports from Queen Elizabeth II. He has excelled as a member of the Platinum Club of Microsoft Corporation and has developed the first innovation competitions in Greece. After 25 years of international career in leading IT companies today Chris is a Technology investor with the European Investment Fund, a Web Entrepreneur and Business Consultant. With a strong social service, he is the Chairman of Young Entrepreneurs organization Junior Achievement in Greece and member of the Innovation Committee of the Hellenic-American Chamber of Commerce. Chris was President & CEO of Microsoft in Greece for 8 years and Regional Manager of 'Marketing & Online Consumer' for Central and Eastern Europe. Previously was the CEO of Intel in Greece for 6 years and Director of Networks for Europe, Middle East and Africa based in London. 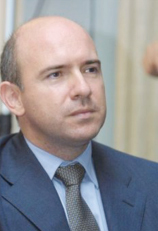 He has assumed an advisory role in technology of the European Union and developed electronic innovations for Airbus, Jaguar and Santa Cruz Operation. His computer studies were conducted at Reading University and UMIST and issues in Management at INSEAD and Wharton Business School.